Food bloggers often get contacted by food and beverage PRs asking if we can promote their product. 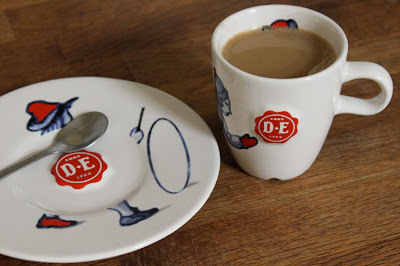 Last year quite a few bloggers ran videos and information from Douwe Egberts. 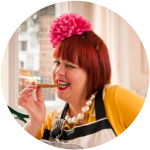 However I’m in a different position from many food bloggers in that I actually make/sell food and drink. I’m also always on the lookout for products that my guests will enjoy. So I had the genius business idea of asking Douwe Egberts to sponsor the coffee course at my dinners. They have a variety of good tasting coffees and I’m still getting to know them. I think my favourites so far are ‘velvet’ and ‘vintage’. Recently they send me some beautiful porcelain cups which means that guests no longer have to drink their coffee from a variety of glasses, cups, bowls and even tea light holders! Chapped and split lips will in future be caressed by the gorgeous creamy porcelain edges of these elegant vessels. Noses will savour the smoky aromas wafting up from these perfectly proportioned demitasses. 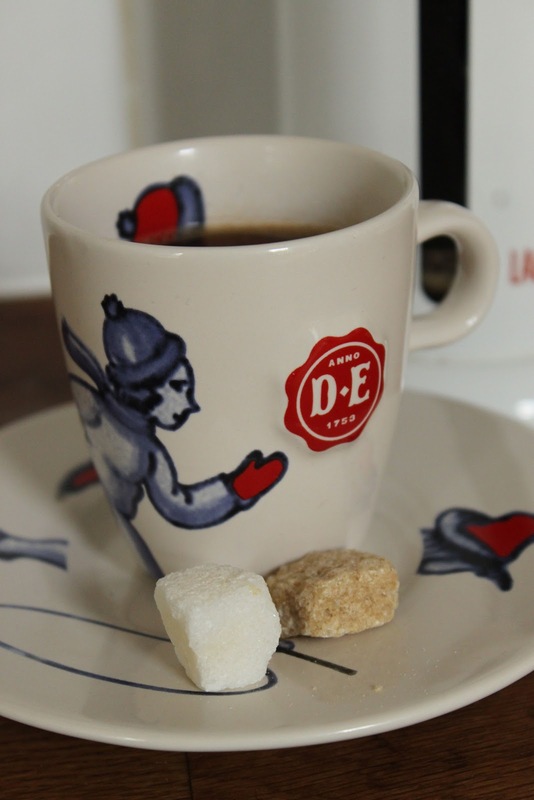 Egbert Douwes started in Holland in 1753 and the design of these cups reflect the vintage of the brand with a nod to the blue and white beauty of Dutch Delft pottery. They also match the European shabby chic style of The Underground Restaurant. I love the raised ‘seal’ logo in the middle of the saucer, also on the cup. I love them, they look so cute. I always loved the coffee in Holland sadly all my friends there are now here! It obviously works as a form of marketing though. When there was no time to get to the cash & carry a few months ago I picked up the DE Vintage in the supermercado instead. Was very good. Smoky variety would be interesting – maybe for an affogato? Lovely coffee cups and excellent idea to get sponsorship like that! great cups but an odd choice of coffee.. it does seem a bit at odds with the rest of your admirably specific and quality-driven choices for food and product. square mile roasters concentrate on single origin and fair trade etc… wouldn't that be more in kind with the rest of your meal? Square Mile is great but would cost more. I'll admit I'm not a coffee geek but I actually like Douwe Egberts coffee. I drink it every day. They approached me so was happy to do business with them. And the cups are lovely aren't they? I love them too. Cups looks very beautiful and most important it is affordable. I like shabby chic style ever.